Using a Project Role form ELFT service users and carers can offer their skills, knowledge and experience to quality improvement work happening all over the Trust. It might be on a project team with Big I or Little i involvement, or it could be working at Trust level on some of our priority areas for improvement. Use this form to add some of your QI interests and details on your availability. Using this information we can link you up with QI Project teams in the Trust who need your expertise and experience! 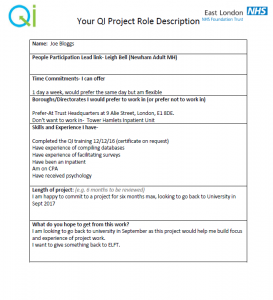 Project teams can also use the Role Description form to share opportunities to get involved with their projects, whether this be involvement with a Big I or little i. You can find downloadable versions of these forms and a completed example in related resources at the bottom of this page.